5Allenzplus: Oh What a Foretaste... 500 strong! So this thing happened. Way back on March 6, I was scrolling Facebook, minding my own business and that of my friends, and friends of friends, and the public at large. Okay, so maybe I was stalking strangers. I won't tell. Anyhoo, one of my fave bloggers, Jen Hatmaker's post jumped out at me. I'd never heard of a launch team, so I didn't really have any idea what I was getting into. I clicked on the link, read the info and applied. Now, in all seriousness, I never expected to be picked. If I recall, it was late in the day so probably all the spots had been filled, but I was curious. I'm pretty sure that I actually said that I hate to read on my application- unless it's life changing or true. No pressure, Jen Hatmaker. I went to bed, and didn't think anything else about it. 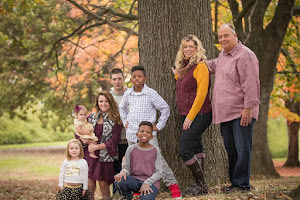 At the time, I knew Jen because of her blog posts, she had adopted and as a result was a multi-racial family and I had recently watched her family renovation show on HGTV. I didn't know about INTERRUPTED, and only knew about SEVEN because my sister had told me about it and I really wasn't interested in giving all but seven of anything up. A few days later, I was deleting the hundreds of emails offering discounts on things I've never bought, and offers to donate to candidates I would never support, and discounts on clothing decades past my prime... and I almost missed it. 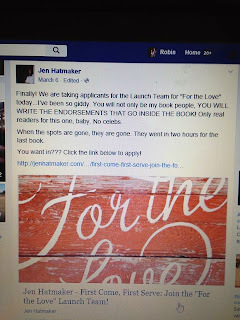 The first thing that happened was the For the Love Launch Team Facebook group- and almost immediately I was in the private company of 496 women and the band of 4 (men) who initially had one thing in common. The launch team. 5000 people applied for the launch team, and here we were, thrown together by chance. I think NOT. Soon a wonderful, unexpected and strange thing happened. These strangers who I've never met became friends. Prayer requests started showing up on the feed, and we began praying for each other. Meet-ups of people in the same geo area started being scheduled. Private messages offering support. And, the quotes. Oh those quotes from For The Love started coming across the feed (obviously from the over achiever, A personalities who read the e-version before I figured out how to get to it on DropBox). I tried hard not to feel inferior. I waited, and waited and waited and finally it came. The advanced copy- the one in print - the life-changing AND true words arrived. And while the crafters and designers and wonderful women with creativity on their beams started making mugs and arm candy and T-shirts available, our lives became intertwined and connected when we shared that our loved ones were dying and kids were sick and miscarriages devastated and marriages are dissolving and jobs are lost and plans derailed and dreams dashed and kids out of control and new life is born and kids are funny, and dreams are launched, and weddings are coming and the encouragement to overcome fears and do the hard is all happening in that feed. And I sometimes try to take it all in but its too much because, well, all but 4 of us are women and that's a lot of words. And still, I drink them in like a perfect Diet Coke on a hot day- I drink them in all hours of the day and night. And I pray over each request whether I officially "like" it or not. And those words, in that red covered book, they've challenged and changed me. I laughed out loud, and cried silently. I took and still take it with me in the car, to the bathroom and next to my bed. And with each chapter I saw ugly truth staring back at me from the mirror and beautiful truth in the faces of my family. And the homeless man on the corner. And those words opened up my God box and let Him out to be God. 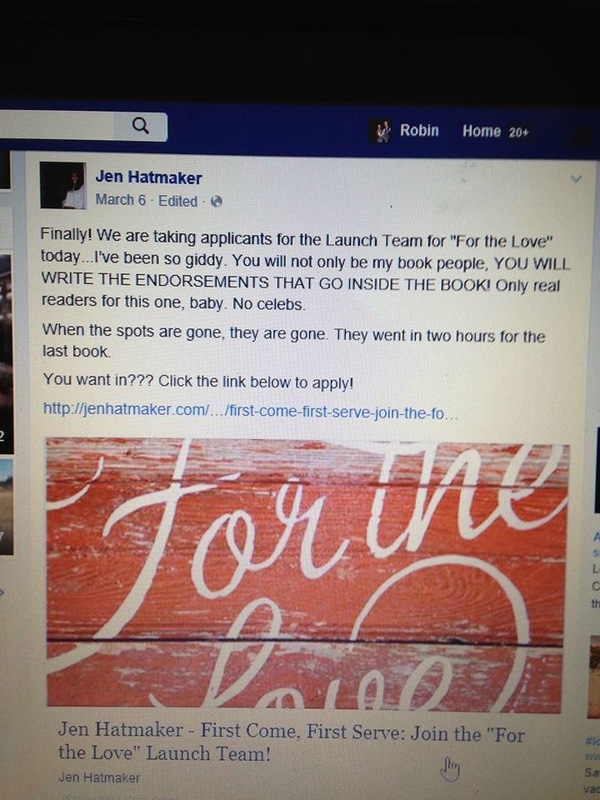 So I'm running around asking my peeps, do you know who Jen Hatmaker is? Have you read her books? Do you know about her blog. She's like us. You'll love her. Check her out. You've got to read this book. FOR THE LOVE, YOU'VE GOT TO READ THIS BOOK. August 18th- that's the day. Keep checking back here for updates and giveaways and sneak peaks. Until then, I'm blessed because I think being on this team has given me a foretaste of heaven. Strangers, from all professions and interests- church goers and church no-goers, wounded and healthy- men and women, young and old, Baptist, Methodists, Catholics and none of the abovers but all who love Jesus and can in an instant be bonded together as sisters and a few brothers in Christ-worshipping and encouraging and praying each other through the hard. Speaking truth without judgement, understanding that different is not bad. I think that's what we'll find when we get to heaven- probably surprised at the diversity of who is kneeling giving praise to the King and singing Holy Holy Holy is the Lamb... because they understood- Be kind, Be you, Love Jesus!